2. Leave root and 1-inch stem on beets; scrub with a brush. Place beets and 1 cup water in a 13 x 9-inch glass or ceramic baking dish; cover tightly with foil. Bake at 375° for 1 hour and 30 minutes or until tender. Cool beets slightly. Trim off roots; rub off skins. Cut beets into wedges; cool completely. 3. Place greens and parsley in a large bowl; toss. Combine vinegar, salt, and pepper, stirring with a whisk. Gradually drizzle in oil, stirring constantly with a whisk. Drizzle dressing over greens mixture; toss gently. 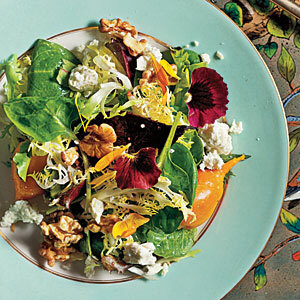 Arrange 1 cup salad on each of 8 plates; top evenly with beets. Top each serving with 1 tablespoon cheese and 1 1/2 teaspoons nuts.